Amanda Dinneen thanks the crowd for attending. 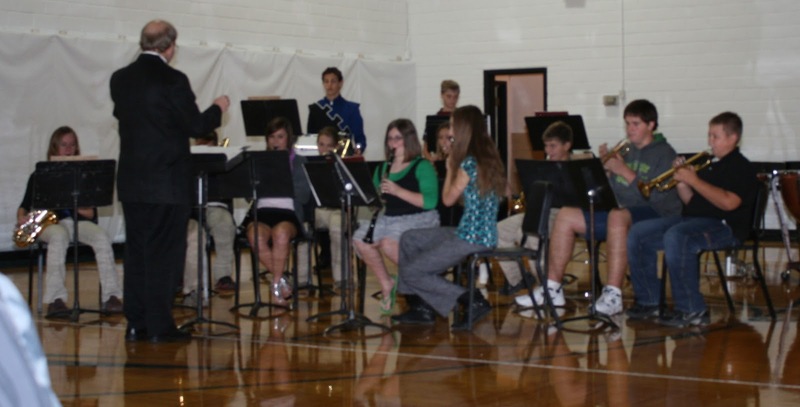 Exeter-Milligan Jr. High Band performed at the Veteran's Day Program. During the Marine anthem Anthony Due a Marine who served in Iraq stood. Army Veterans Sterling Dyer, Larry Cudaback and Alan Songster stood during their anthem. 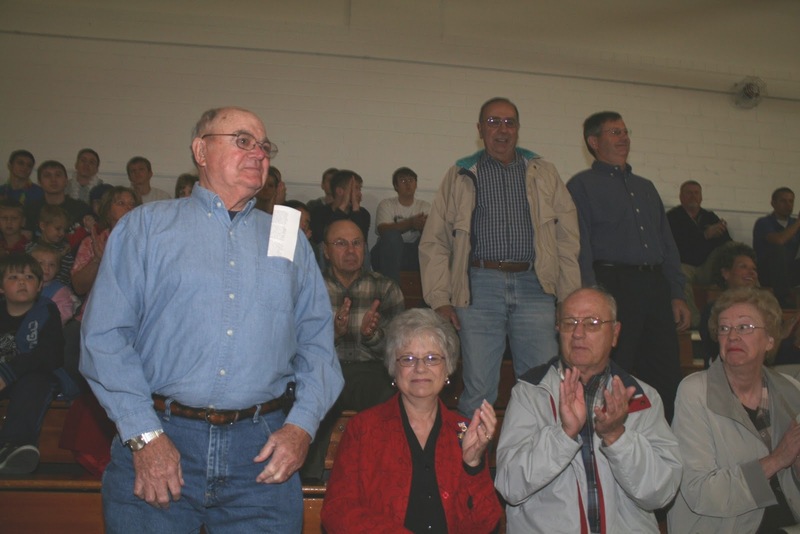 Although his branch of service was not part of the song, Bob Dumpert was recognized for his service. The Exeter-Milligan band performed several numbers during the program. The Exeter-Milligan school held the Veteran's Day Program on Wednesday, November 10th this year. 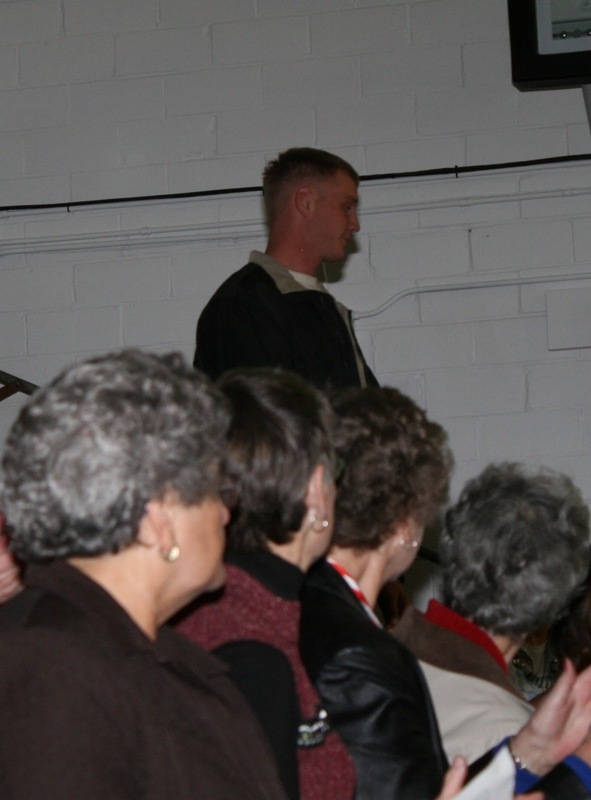 All veterans and their spouses were welcomed to a coffee at 9 a.m. hosted by the National Honor Society. Veteran's, community members and faculty, students and staff were welcomed by Exeter-Milligan senior Cody Soukup who led the attendees in the pledge of allegiance. Soukup asked all veteran's in the crowd to stand and they were recognized with a round of applause. The Exeter-Milligan High School Choir led the crowd in the Star Spangled Banner and the performed the haunting Civil War ballad, Brother, My Brother by Jack Murphy and Frank Wildhorn. This year's speech by Vietnam veteran Tim Wilbeck was pre-recorded. Wilbeck recalled the prominence of reality television stars but reminded the crowd "it is important to remember who the real stars are." Wilbeck also spoke of the importance of Veteran's Day and how it is "to honor not just heroes but those who have served." Remembering was a great deal of Wilbeck's theme as he quoted President Calvin Coolidge who said, "A nation who forgets it's defenders will itself be forgotten." 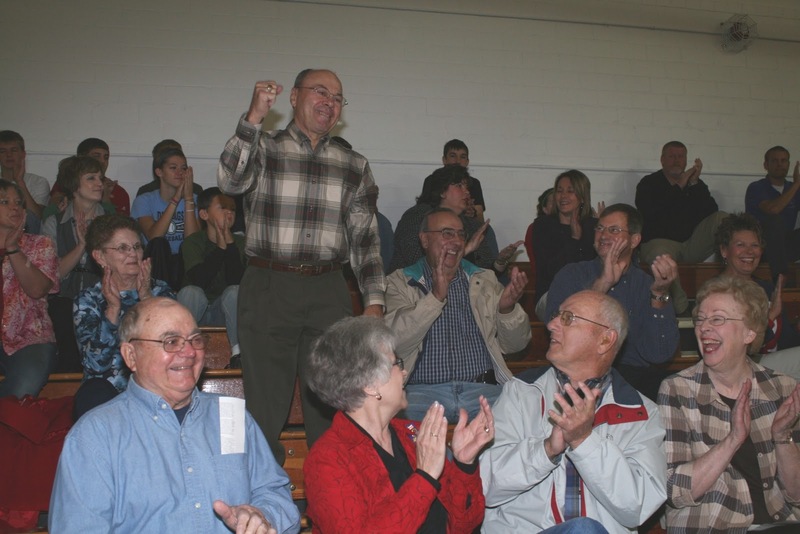 In remembering Wilbeck encouraged the crowd to be there for the families of soldiers who are currently serving or who have lost their lives, "Don't underestimate the power of saying thank you to a Veteran. Showing our appreciation is the least we can do," said Wilbeck. The Exeter-Milligan Junior High Band performed Armed Forces on Parade asking Veteran's to stand when the anthem from their branch was played. After the song, Band Director Shane Whitford asked those servicemembers whose anthem wasn't played to stand and be recognized. 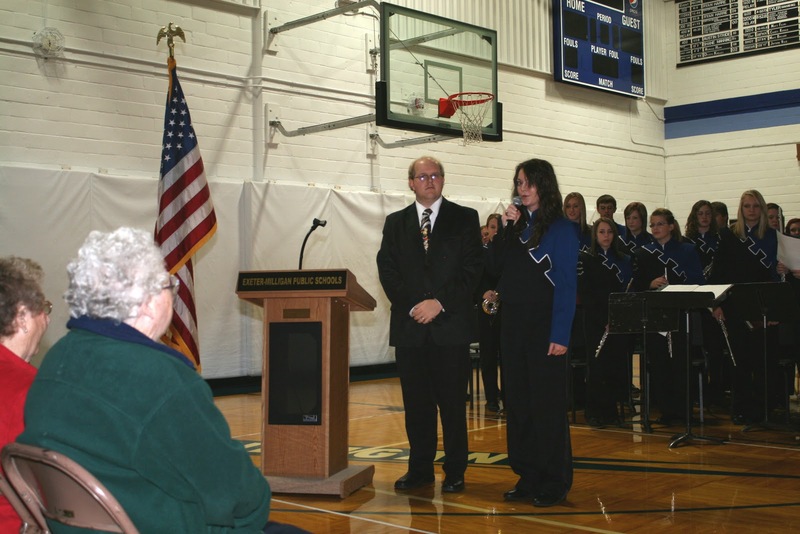 The Exeter-Milligan High School Band performed Americana and Valley Forge March before Amanda Dinneen closed the program.